What are the Dolores Project allocations? 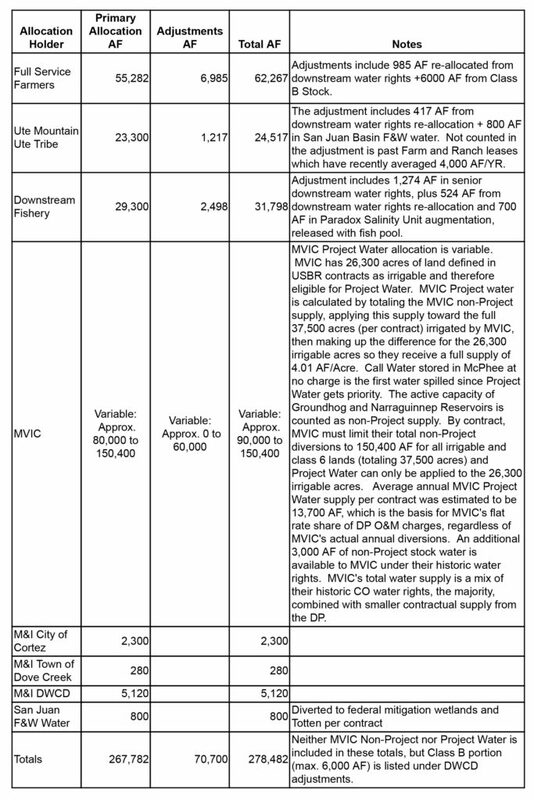 The following table catalogues the contractual allocations of Dolores Project water as well as any associated adjustments. How big (surface acres) is McPhee? When full, McPhee Reservoir covers an area of 4,470 acres. It extends 10 miles up the Dolores River, 4 miles up Beaver Creek, 1 mile up Dry Creek, 2 miles up House Creek, and 2 miles across the Sage Hen flats. How much annual inflow does McPhee receive? Over the past 30 years, annual inflows into McPhee Reservoir have averaged 327,000 AF. Inflows into the reservoir can vary greatly year to year; in the drought of 2002, annual inflows totaled merely 79,757 AF, whereas just three years later in 2005, recorded inflows were up to 516,457 AF. Inflows are completely sourced in the seasonal snowpack, which is also the primary means of forecasting the annual water supply. Construction of McPhee Dam began in 1980 and ended in 1986. 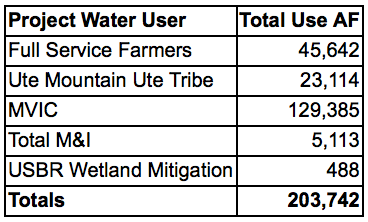 How much water does the Dolores Project divert from the Dolores River? 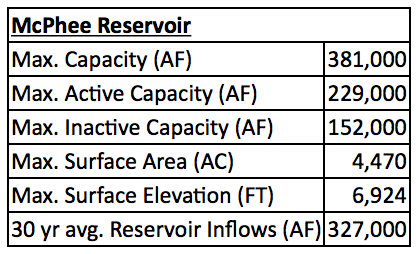 The following table summarizes the annual diversions from McPhee reservoir averaged across the last 15 years. Note that there is water released downstream year-round for the fishery as well as semi-regular controlled releases from the dam during the runoff season. How many irrigated acres does the Dolores Project serve? The Dolores Project serves roughly 63,000 irrigated acres within the Project’s Full Service Area (29,000 AC), MVIC’s classified lands (26,300 AC), and the Ute Farm and Ranch Enterprise (7,700 AC). How much municipal water does the Dolores Project provide? On average, since the year 2000, the Dolores Project has produced 1,624 AF of municipal water annually. How often has McPhee “spilled”? Historically, McPhee has spilled roughly five in every ten years. How much hydropower does the Dolores Project make? In 2016, between the Towaoc Power Plant (TPP) and the McPhee Power Plant (MPP), the Dolores Water Conservancy District produced enough green power to supply 25,394 US households year-round, with MPP running all year, and TPP running from April through September. This is based on the US Energy Information Administration statistic of the average US household using 909 kWh per month. There are roughly 10,962 households in Montezuma and Dolores Counties, so DWCD produced enough power in 2016 to power these local households for 2 years and 4 months. The power produced by the Dolores Project is added directly to Western Area Power Association’s grid. How much water does McPhee Reservoir hold? McPhee Reservoir can hold up to 381,000 acre-feet when full at 6,924 ft in elevation. Zebra and quagga mussels (mussels) are aquatic nuisance species (ANS) that were first confirmed in Colorado in January 2008. The mussels have severe negative impacts on natural resources, fisheries, recreation, economics and water distribution infrastructure for municipal, industrial and agricultural supply. When are the next lake releases?